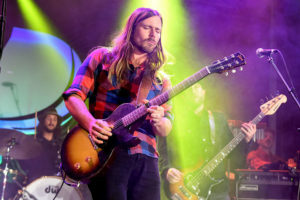 Lukas Nelson is a 2019 BAFTA Awards winner! Along with Bradley Cooper and Lady Gaga, the singer-songwriter earned the Best Original Music trophy, for his work on the A Star Is Born soundtrack. >Cooper was in London on Sunday (Feb. 10) for the 2019 BAFTA Awards ceremony and accepted the honor for himself and his collaborators. Nelson did not attend, nor did Gaga. “We won a BAFTA! Congrats to my amazing friends @ladygaga and Bradley Cooper, and to my amazing band @promiseoftherealofficial for creating something truly special! !” writes Nelson on Instagram. “Thank you for the recognition @bafta. Nelson served as a musical consultant for the 2018 film. The fourth remake of the 1937 movie A Star Is Born stars Cooper and Gaga, but Nelson is also one of a number of country- and Americana-leaning artists who wrote songs for the soundtrack. Nelson has writing credits on seven of the movie’s songs, and he produced seven of the songs as well. In the film, Nelson also plays a member of Jackson Maine (played by Cooper)’s band. Nelson, Cooper and Gaga’s A Star Is Born soundtrack competed for Best Original Music at the 2019 BAFTA Awards against the soundtracks from BlacKKKlansman (Terence Blanchard), If Beale Street Could Talk (Nicholas Britell), Isle of Dogs (Alexandre Desplat) and Mary Poppins Returns (Marc Shaiman). A Star Is Born and its stars also earned nods in the Best Film, Leading Actor, Leading Actress, Director, Adapted Screenplay and Sound categories. Also known as the EE British Academy Film Awards, the BAFTA Awards are organized by the British Academy of Film and Television Arts (BAFTA), an independent, arts-focused charity. A complete list of 2019 BAFTA Awards winners is available at BAFTA.org. This entry was posted on Sunday, February 10th, 2019 at 4:40 pm and is filed under Awards and Honors, Lukas Nelson. You can follow any responses to this entry through the RSS 2.0 feed. You can leave a response, or trackback from your own site.